At Excel Consultant, our team of consultants, programmers and trainers is dedicated to helping businesses, organizations, and institutions succeed using the power of Microsoft software. After meeting with you either remotely or on-site and performing a project discovery session to better assess your needs, we will create a statement of work. 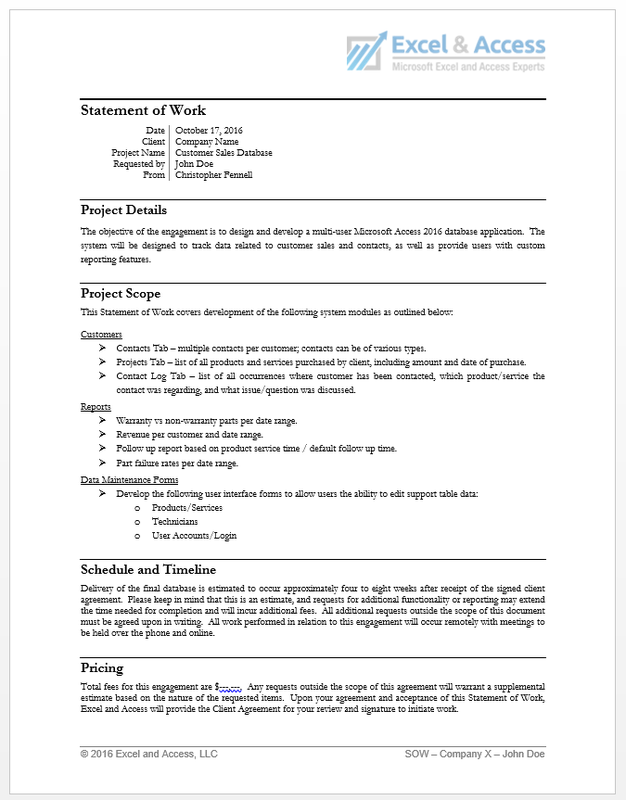 This document facilitates productive collaboration between your executives and our experts by providing important information about the goals, scope of the project, logistical details, assumptions, cost and timing. What is the Purpose of a Statement of Work? Clear communication is key to successful cooperation, especially in the technical realm of client focused services. Creating a statement of work allows us to ensure that our team and your team are on the same page, clearing up any misunderstandings before work even begins so that the process can go smoothly. Once you approve of the statement of work, our experts will follow this document exactly to execute your project according to the agreed upon specifications allowing for flexibility on the margin as needed throughout the course of the project. The ultimate objectives for the project, as well as how and when these will be met. The products or services we will provide throughout the process, and when they will be delivered. For example, we might indicate that we will redesign the interface for your company’s data tracking system by the third week of the project. We would also describe the details of how we plan to execute this redesign (in easy-to-understand terminology) in this document. The names, duties, and contact information for key personnel and groups involved in the project so that you can communicate with them as needed and understand their roles. A precise schedule and timeline for the project so that you know what will be provided and when. Pricing information, broken down for each task of the project, as well as the expected payment schedule and any contingencies. The legal terms of our consulting agreement with your company. Both parties will sign this document. Information about how we will help you maintain your new Microsoft systems so they continue to operate well for many years to come. When we present your statement of work to you, we encourage you to look it over and let us know if you have any questions or concerns. We are happy to modify this document as needed so that you feel satisfied, informed, and comfortable proceeding with your project. Below is an example statement of Work for one of our recent Access projects below.